The Cobbler: Barefoot No More! You might remember the old adage, “the cobblers children have no shoes”. I have always been fascinated by this. Why do we ignore applying what we do so well to ourselves? Somehow, we build an expertise and then forget we have it when we need it most. That was exactly the situation I discovered when I was asked by Bob Schwartz, General Manager, GE Healthcare Global Design & User Experience, to come help them improve team performance. When I met the team, I was blown away by the diversity of talent and the potential of the team. Yet Bob shared with me that it felt like team was “dragging their left foot” and being held back from their potential despite the obvious talents on it. Could I help? As I met with each member individually I was surprised to see how they could not see where the other players were coming from….they had no empathy for each other. This was unexpected. This was GE Healthcare, incredible practitioners of design thinking who leverage it routinely in delivering their human inspired designs. At this moment the adage of the cobbler flashed into my mind. Empathy was job 1 and we used that first before impact or productivity could be addressed. While the team knew and liked each other very well as people, they had not worked on their ability to see the world from the perspective of the other. This turned out to be mind-opening. An open mind sees so many more possibilities than a closed one, and so once we turned our attention to the business of how they could increase their impact through interdependence and integration, the ideas began to flow. Business ideas. Organizational design. KPIs. The Global potential unleashed. 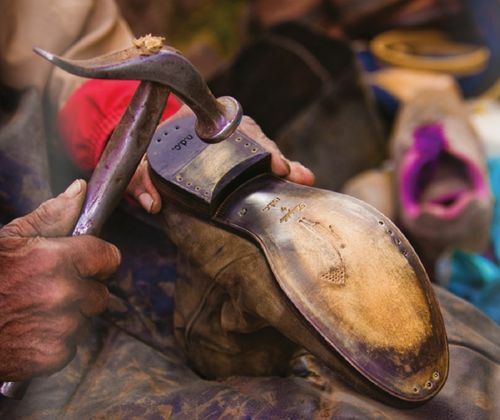 They knew all the tools I used as practitioners of design thinking themselves, but like the cobbler, they just couldn’t see how to apply it to their own group. A good reminder to us all to not assume we are leveraging best practices on our own challenges just because we know how to do it for others! What do you do best? Is your team doing it at their best? If not, consider how to apply it on yourselves and don’t be shy to ask another expert to help you so you can have some objectivity guiding the process.